Wings of Orussidae from Goulet and Huber (1993, fig.24) . 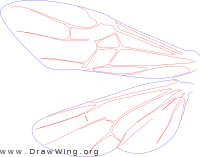 Wings of Orussidae from Goulet and Huber (1993, fig. 24) . Head (facial view) of Orussus redrawn from Gauld and Bolton (1988, fig. 40).